I am still so in love with monthly goals, and I get excited at the end of every month when I get to make new ones. February is no exception! Last week I bought some under-bed boxes and started moving a bunch of stuff out of the closet so I can actually see what’s in there. I am clearing out clothes that don’t fit now (but might in the future), things that are out of season, and my fancy work clothes. I’m about halfway done, and it’s exhilarating to get things out of the way that I haven’t worn in years, but now I’m at that part where a bunch of harder decisions need to be made. And I just want to push on through it so I can have the job finished and enjoy my clutter-free closet. So here’s to that! Quilting is one of the crafts I want to try this year, and I’m all poised with a great book, a rotary cutter, and a cutting mat. I just need to buy fabric and start having fun with it! I have been missing going to the gym with Eric–he runs slow enough to talk to me, and he adorably smiles at me from the weight room while I’m on the exercise bike. My membership expired at the end of last quarter, so I want to get it renewed so I can get back to pumping iron hanging out with Eric in a slightly athletic setting. And I’ll welcome any endorphins that want to come along for the ride. I have really enjoyed being back in the kitchen this past month, and every time I make a grocery list, I try to include ingredients for one or two new recipes. There are so many amazing food blogs out there that I sometimes forget I have a shelf full of awesome cookbooks, so this month I want to hunt through them too and pick out some fun new things to try. When we were home for Christmas, I thought nothing of whiling away an afternoon reading, but I’ve noticed that since I’ve been back, I don’t come to it often as an afternoon break. I still read every night before I go to bed, but I would like to re-incorporate a bit of reading time in the afternoons too, when I’m on work breaks. There is nothing more luxurious than curling up on the couch with a good book. And I have got plenty of them on hand. Love Eric: what do I mean by this? I love Eric madly, and he knows it, especially since I tell him approximately twenty times a day. I can’t help it! When I told him I was going to make this one of my February goals, he said, “But you are the champion of loving me!” It’s just that this is going to be an extraordinarily busy month for him at work, and so I want to find special ways of loving him and supporting him and taking care of him during these hectic weeks. I have no doubt that he would do the same for me. That’s what love is. And, of course, as always, I plan to take tons and tons of pictures. How about you? 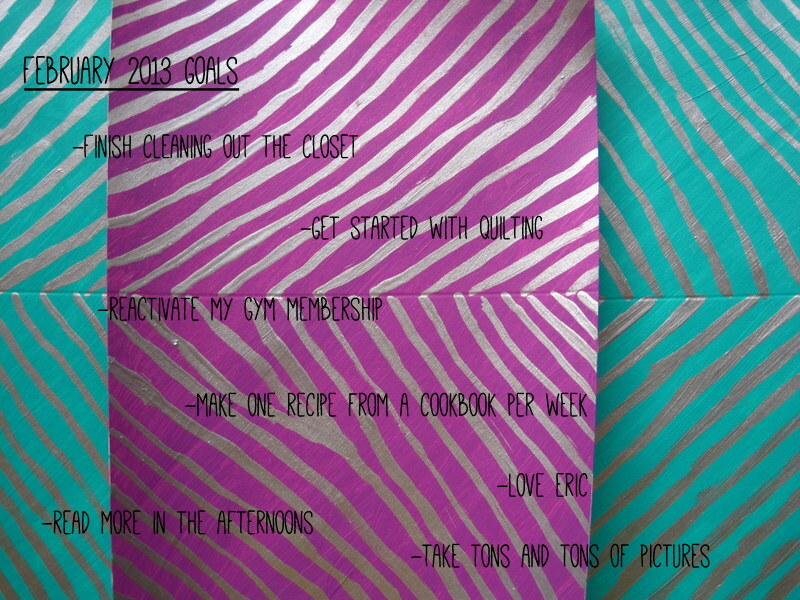 Do you have February goals? I’ve updated my January goals here and will be back in March to give a report on these. Update, March 2013: Well, it’s been a pretty awesome month! I totally cleaned out the closet, and I totally would not have done it if it hadn’t been on this list. Huzzah! It feels so good to actually be able to see what’s in my closet, and to know that a bunch of sweaters and dressy clothes are in under-bed storage, should I ever need them. Win-win! I did sort of get started with quilting insofar as I read the book that Eric’s awesome brother gave me on quilting for Christmas. Now I am ready to tackle some projects! The fabric stores are all several towns away from Pasadena, but I pledge to get there in March! I did reactivate my gym membership and got a shiny new ID card, which, again, I totally would not have done if it hadn’t been on this list. I think I conquered the cookbook goal too, but I will hold on to it in the future. It’s a good one to have. I totally read more in the afternoons, and I loved every minute of it. I hope that I loved Eric well in February, and I think he would say I did. (Well, he did say so, so that is confirmation!) We are both relieved to have this proposal in the rearview mirror, though, and to have more time to spend together. And I have lots of pictures to prove it! Join Costco. Buy large amounts of things I do not currently buy and that I can’t get other ways around here. Learn to use the food sealer thing so I can freeze said Costco items. Finish current sock. Make kitchen decisions for condo. Complete Istanbul research. Go to Istanbul. Recover. I guess that’s enough. I eagerly await the results of said goals! If I went to Costco I would buy giant barrels full of beans and grains, if they had them. And also bulk spices, which are terribly hard to find here. Humph! I’m all for more reading in the afternoon and look forward to including this activity in my future life. 🙂 As for cleaning out the closet, I also see that in my future, but it’s infinitely less fun than the reading…unless refilling it by shopping is part of the task? Thank you! I am pumped about them. And I know you are going to have an awesome month as well!